September 2014 - Whiteboard Consulting Group Inc.
Nicole and I have stumbled into a bit of a theme these days, talking about the basic activities involved in Process Improvement and sharing with you some user-friendly and simple templates. First, we wrote about how to actually map a process, and next we covered how to look at that process map and assess which steps are a waste of effort – i.e., they add no value. Both those blog posts include handy templates which you can edit and manipulate to suit your needs. In Nicole’s example, we learned that External Failures were taking 56% of the total time involved in completing a process. Since External Failures are clearly non-value-add steps, that is where we will focus. It may seem obvious, but often it’s over-looked so I’ll say it again: start your process improvement work on the steps that offer the most efficiency opportunities. The next step then, is to look closely at the External Failures and think about what might be some root causes for them. By reducing or eliminating them, not only will we reduce the chance of upsetting a customer, but we will reduce the amount of time it takes to complete the overall time to do the process. A tool we love to use originated in Japan in the ’60s. Known by several names (Ishikawa diagram, Cause-and-Effect diagram, and Herringbone diagram, to name a few), we use the most common title – the Fishbone Diagram. This diagram is nothing more than a brainstorming tool that helps groups think about potential root causes of a problem or issue. Lucky for you, click on this Fishbone Template for you to use in your next brainstorming session. It will download automatically. At the “head” of the fish, write the problem you want to address. 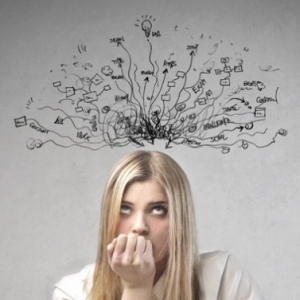 You can start brainstorming sessions several ways. One we like to use is to give everyone a stack of sticky notes and a pen. Ask them to look at the categories and write down as many potential causes as they can – one per sticky note. Now have everyone put their sticky notes on the wall, clustered in the six categories. Discuss and add more (because people always think of more). Remove duplicates. 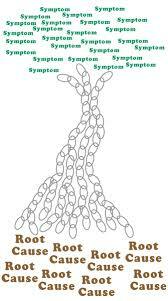 Draw a line towards each “bone” and write the potential cause on it. Ask if there are any further “bones” that might go off of the one you just wrote. If there are, then draw a line connected to that line. Keep going until you’ve written down all the ideas, and then ask if there are any more. Now you have a big list of ideas, and the trick is to figure out which one of those is the most impactful. How do you know which one(s) to fix first? Well, Nicole will tell you that next week… so stay tuned! PS – details on our new course, Leading Process Change, are coming within the next few days. Stay tuned to our Twitter (@whiteboardcons) and Facebook feeds, not to mention our website. A few weeks back Ruth blogged about how to do a basic process map (click here to check it out) and it included a free process template for you to use as well. You’re welcome. Process mapping is a huge part of our business. We know process mapping creates engagement and buy-in for process change (when done in a workshop setting) , is a great visual tool, and can improve effectiveness and efficiency. Put a circle shape in the swimlane for the person/group that starts things off. Write the word “START” in it. Put a square shape next to the circle and label it #1, and write the step. Proceed with each consecutive step. Add the arrows last (you almost always have to change them as you go). When you reach the end point, put a circle with the word “END” in it. AND, I can’t believe Ruth forgot this. I am going to gloat since she is a stickler for this one. What do I do next, after the Process Map? Great question. The next 2 steps are to validate your process map and look at value added steps. So if you’ve done your process map in a workshop style setting, you likely had many of the stakeholders (the swimlanes) of the process in the room. So validation in this case is finalizing that process map and sending it back out to those participants to see if what you’ve documented is accurate. Talk to the people in the process and follow the product or service through the service to make sure steps and swimlanes have been captured accurately. Ensure that you haven’t mapped the best case scenario, or worst case scenario. The map should be representative of how the process normally works. Now for the meaty stuff…. Does the customer consider this step important? Has the product or service had a physical change? 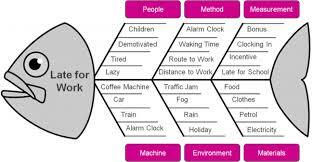 Moves: Steps in the process where the product or service is in transit from one place to another. How many times and to how many people in your organization does this touch? Delays: Steps in the process where the product of service is waiting for the next step in the process (a great example of this is approvals or sign-offs). This is your classic bottleneck. How do you do this? Well by filling out the super easy Process Summary Analysis Template of course! Step 2: Enter the amount of time it takes to complete this step in minutes (don’t know exactly? Time it a few times or guesstimate for now), sum that row in minutes, and its % is 100% because we are summing the whole process. Step 3: Identify which process steps are value added and not value added. Sum the number of minutes for all the boxes that you’ve identified (in this case we have an x in step 1 and step 6 at 1 minute and 5 minutes respectively, so we have 6 minutes of value added work and 75 minutes of non-value added work). 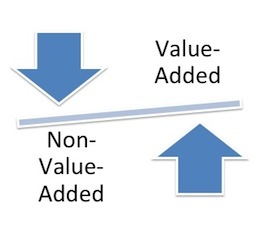 Step 4: For those steps that are not-value added, identify what the type of non-value added activity it is. Step 5: Assess the percentages, and start working on the biggest first. In this case 56% of the non-value added steps are due to External Failures. That should keep you all busy for a little while! Also stay tuned for more info about our new “Leading Process Change” Course! Over the next few weeks you’ll see guest blogs from our speakers, more info on the course, and more templates I think! What do you think of this template? Did you use it? Was it helpful? Let us know at info@whiteboardconsulting.ca/staging or Tweet us at @whiteboardcons! More questions for us? Use #DearRuthandNicole! This week I taught a two-day course on behalf of the Centre for Leadership and Learning in the Ontario Public Service (OPS). It’s called “Management Essentials,” and is for non-managers who want to either learn more about how management is expected to perform within the values and objectives of the OPS, or to understand what it takes to become a manager – thus being able to assess their own skills gaps and build them up accordingly. This is a great course, and I enjoy teaching it so much not only because the materials are current and relevant, but because the people who attend generally WANT to be there (vs. being “told” to take a course in presentation skills, or “how to write a briefing note”). Teachers reading this will agree that when people attend because they want to, they are generally much more engaged and the class has more energy. This was true this week – a great class filled with 35 interesting people from many different areas of the OPS, with differing levels of experience and terrific stories to bring life to the material. One: We need to remind people, over and over again, that THEY are responsible for their careers and their professional development. One of the conversations we had (a couple of times) relates to the last blog post I wrote (Does Your Manager Like People). 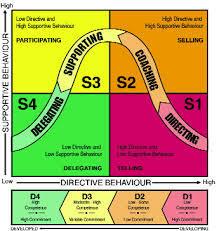 We had just finished discussion on the Situational Leadership model of applying directive vs. supportive leadership techniques. This tool is a BIG hit with people – while complex at first, it is extremely helpful for new managers when they need to accept and learn that their natural, or comfortable, style of learning may not be appropriate in all situations. It helps them assess, adapt, and communicate in a more effective way. “Ah, bless your heart,” I thought. I made sure to share with the class that in most organizations, there is no training to become a manager. (As an aside, I may enjoy a little too much dropping those bombs and watching the reactions.) The conversation that followed was an important one, as people realized that it is up to them to learn how to be a good leader. A great manager should be encouraging their teams to learn and grow, develop career goals and job shadow, take courses, or broaden their perspectives. In the absence of a great manager, many people flounder and future talent may be lost. Two: There are employees out there who want to innovate, change, and improve, and we need to find and harness that energy more effectively. After the “manager training is up to you” conversation, there was a slight shift in energy, with more questions aimed at the application of the course material in a practical way to help people apply for and win new jobs. Not an easy question to answer. Of course there are process jobs out there, and within the Ontario Government there are specific areas that are more process-focused than others. The trick is in finding those job descriptions and being able to read between the lines and know that certain phrases indicate a culture of process improvement more than others. The real key is meeting the right people. This student was taking control and doing the right things – taking courses, asking questions, discussing his goals and dream job criteria with people, and being open to new opportunities. By doing so, he was exposing himself to more people who might be able to point him in the right direction. I’d love to see the process-focused culture shift happen more quickly – not only in the OPS but in other private-sector organizations as well. Imagine if more job descriptions included a requirement for some type of Innovation Thinking, or the ability to demonstrate a process-improvement focus as part of regular job functions. 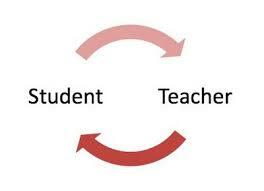 I teach again in a couple of weeks… can’t wait to see what my students teach me then!! 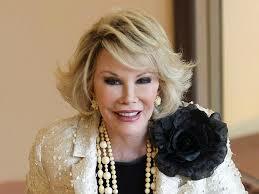 Love her or hate her, Joan Rivers represents more than cringe-worthy celebrity fashion bashing and plastic surgery. She was part of my childhood growing up. I would nervously glance over at my Macedonian Nana, watching Joan’s latest antics, her mouth and eyes wide with shock, waiting for her to become wildly upset. Suddenly she would burst into infectious laughter and I’d be relieved we wouldn’t have the change the channel. In recent years, Joan fed my insatiable hunger for celebrity gossip, either providing it herself, or providing me great scathing material to copy so I could provide hilarious fashion commentary for my friends when out for drinks. Despite an image that often resonated more with plastic surgery or her latest offensive comment, she somehow managed to forge a role in women’s leadership. Let’s look beyond her shameless obsession with looks and see that she did in fact serve as a role model and inspiration for women, overcoming blatant sexism to rise up as one of America’s first female standup comics. 1. Say it like it is. Joan sure did not have the “nice filter” that we in business have seemed to grasp on to. A good leader has the ability to not only provide the right recognition and rewards when necessary, but can also provide great critical feedback. DISCLAIMER: I am NOT suggesting that we use sarcasm, teasing, and ridicule to provide feedback to our teams. In fact, it was that razor sharp tongue that created a 3 decade long dispute with the Tonight Show – we don’t want that at work. No thank you. What we can do is channel a bit of that blunt, “say it like it is” attitude to just SAY what we need to say. Even if it is hard, or we don’t want to hurt someone’s feelings. Joan’s humour was often self deprecating. The greatest leader’s and bosses have the ability to recognize their strengths and weaknesses, and rather than fear their weaknesses and hide them, be okay with who their are. Let’s be honest here. I’ve been using self deprecating humour since birth. But as a leader, sometimes I had this fear that if I showed my team that I wasn’t perfect they wouldn’t respect me. Not necessarily true. Demonstrate a humble attitude that tells the team: “I can’t do it all I need your help.” It is this kind of attitude that brings a group of individuals to works together with you as their boss to become and interdependent team -one that achieves more than every individual could do on their own. Work is serious. Your job is serious. Issues at work are serious. But, it’s okay to laugh. It’s okay to make things light and fun, and to be serious when appropriate. Again, I cannot profess that Joan taught me how to be funny (I was already incredibly hilareous). But her passing reminds us to share some laughs with our teams in her memory. To conclude. I am hilarious, but also very humble, and when I channel my inner Joan, I can also tell people what I need to tell them without fear of hurting their feelings. 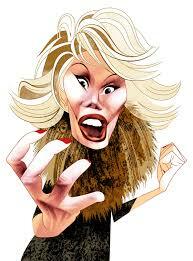 Tell us about your inner Joan @whiteboardcons, #JoanRivers.